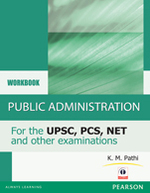 The Public Administration Workbook provides you with the concepts and facts that are needed for success in the competitive examinations. This comprehensive workbook is designed to sharpen your analytical abilities and evaluate your preparation. The standard and pattern of this workbook correspond to those of the UPSC, State PCS, NET and other examinations.